Slovenia may have closed its borders to international refugees, but it’s remarkably open to international literature. 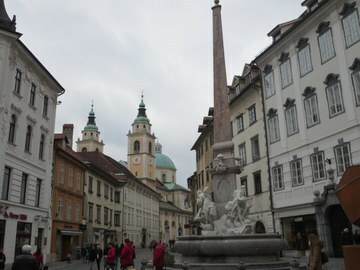 There are two special reasons that I was keen to leave the UK to visit Slovenia this February: first, as the UK’s commitment to the EU wobbles precariously, I wanted to view Europe and the UK from a different perspective, and second, because my last trip to Slovenia took place a whole quarter of a century ago. When I was here for the BBC twenty-five years ago, Ljubljana was a drive-through city. Charming and fairytale-like, with the river running through the centre, a castle on a hill, some excellent white wine, a famous rock band called Laibach, an hour from Trieste. But in news terms in those days it was infinitely drive-through-able. After all, by comparison with the dramas and horrors in the rest of Yugoslavia, Slovenia was a relative haven, enduring ’only’ a ten-day war. By 1991, I’d been all over Eastern and Central Europe reporting and producing for BBC Radio 4 and Ljubljana, I concluded then, was lovely but forgettable. Walk into most shops in Ljubljana and the young staff switch easily from Slovene to German or English. I asked one fluent teenager in a shoe shop why. “We are a small country and we must speak languages to survive”, she said. A waiter in a traditional Slovene restaurant said he spoke Serbian, Slovene, English, Italian and Russian, thanks to his family background (most Slovenes admit to being mixtures – understandably after 70 years as ‘Yugoslavs’) but also thanks to the geography of this long thin strip of land bordering so many countries. In the Saturday market in Ljubljana’s old town centre, by the famous Three Bridges, the nobbly apples, garlic heads and cabbages, are cheap and local. It was a beautiful sight. Seeing piles of dried fruits and nuts at one stall run by a red-cheeked lady with a traditional embroidered headscarf, my Yugo-nostalgic brain went into overdrive: “What a perfectly healthy, middle-class souvenir to take home to London!”, I exclaimed. However, after 15 minutes of vigorous pointing, the chuckling old lady sent me packing with a single Tunisian date – none of her goods were from Slovenia I realised and I could buy them just as easily in the UK – but not served by a lady in an embroidered headscarf. 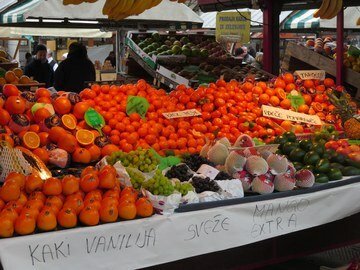 Such abundance though – the heaving stalls and Ljubljana’s full shop – made me nostalgic for that same period in Bulgaria when, after three weeks on the road for the BBC and no fresh fruit, I spotted a food aid lorry delivering bananas. I ran up to it and begged to buy one banana. It cost me ten dollars. Another part of life is proudly intact and proudly Slovene: publishing. For seventy years the countries of Yugoslavia were encouraged to speak ‘Yugoslav’ and you could argue – and there are plenty of arguments! – that the various languages are similar. The Slovene language and literature belonged to the big Yugoslav melting-pot up to a quarter of a century ago, along with Croat, Serb, Macedonian, Montenegrin and Albanian. Everyone in Yugoslavia sort of understood one another, families were rarely mono-lingual or mono-ethnic anyway, so it always worked. 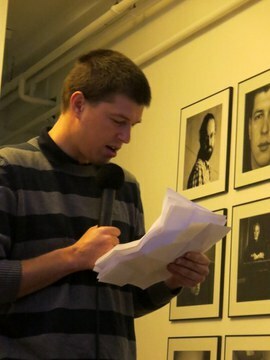 Goran Vojnović, one of Slovenia’s leading novelists and screenwriters, comes from a Croatian background. He still feels Yugoslav. His best-selling novel Yugoslavia, My Fatherland – out in English in 2015 – was a rare break-through success on the English market. Most Slovene novels enjoy an initial print run of 500; if you reach 2000 with your novel then you are a success. Goran sold 20,000 copies in Slovenian, even before it was translated. This tall, towering man said to me, “These days so many books are published in Slovenia – about 2500 each year, and there are so many literary magazines and children’s books that no one can possibly read them all”. 2500 books a year: that’s more per head of population than any other country apart from the UK. There are certainly enough writers to go around. Slovenia has one large publishing house, Mladinska Knjige, also active across Yugoslavia in the old days. It has several medium-sized, and small, independents. The publishing house Beletrina, one of the best known, the most successful at international outreach and the creator of a successful literature festival FABULA, is firing on all cylinders, operating largely on European Union and other grants, publishing 50 books a year, half of them in translation, determined to translate the world’s classics into Slovenian. This is partly the ambition of a proudly patriotic new nation, something encouraged in a country forging a fresh identity. “For decades I’d been reading the Slovene classics in English or German but now I can read them in my own language”, Goran told me happily. The fiery-haired Superwoman, Gabriela Babnik, another very public and successful Slovene author, chatting with me over Italian ice cream, addressed another interesting issue: “I write fictional novels,” he told me, “but even novels here are interpreted as fact. Everyone believes that all I write is about me and that all my characters are real. They’re not. The fact that my husband is black and from Burkina Faso means I’m always asked to comment in the media on racism or immigration! 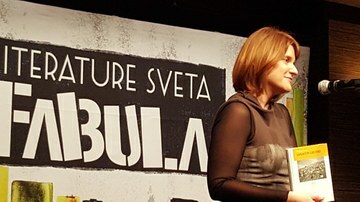 It gets worse: there have even been cases in Slovenia where fiction writers have been taken to court over allegedly criticising, or falsely representing, real events!” Gabriela continued, “This is such a nervous society beneath the pretty surface. And I don’t see the point of only being published in Slovene. We are such a small country, writers here need to be translated and we need to read from other countries”. This, she added, is why she is delighted that Beletrina – with its international outlook – is her publisher. As I skimmed the bookshelves of the Mladinska bookshop (no big global chains here yet), I noticed new translations into Slovene of the Colombian Juan Gabriel Vasquez and the Icelander Sjon. How lovely: there’s a translator from Icelandic into Slovene! 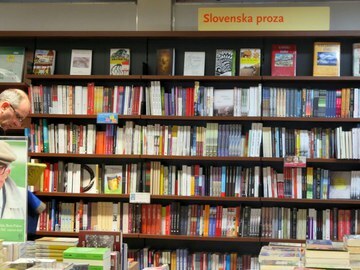 I scanned the shelves again for the name of Slovene writers I had read in English translation over the last few years and realised that I’ve read a healthy number of them: Gabriela Babnik, Goran Vojnović, Evald Flisar, Slavoj Žižek, Drago Jancar and Miha Mazzini. Just like several other small countries in recent years – Iceland, Malta, Montenegro, Belgium or the Netherlands (and many more) – Slovenia has produce a number of interesting, even excellent writers. Someone should research this phenomenon! 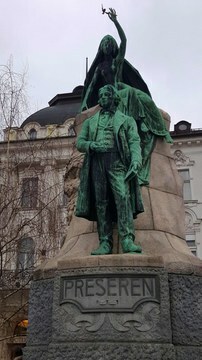 Lo and behold I notice the next day, down by the Three Bridges, bang in the centre of the city, the weather-stained but magnificent monument to the country’s national hero, Preseren. ‘Kiss With Language’ is the rather odd title of a special exhibition of language and literature at the National University Library in Ljubljana. It has created the first ever exhibition of Slovenian language grammars, dictionaries and manuscripts, from medieval times until today. Rare treasures indeed from a proud new Slovenia pushing its uniqueness hard. Books and language are part of that public push. There are 400,000 words in the Slovene language, we are told, and Slovene received its first grammar in the 16th century, written down by the great scholar Adam Borocic. It’s still used today, recently updated by Joze Toporisic, a feted linguist. In the corner of the exhibition there’s a box to encourage visitors to vote for their favourite Slovene word. 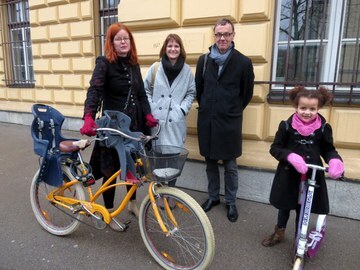 The overwhelming favourite so far is ‘ljubezen’. ‘Ljubezen’ means ‘love’. A lot of love has gone into Slovenia’s strategic rebranding since 1991. After some trial and error, the marketing slogan that stuck is ‘I FEEL SLOVENIAN’, white on a green background, in English and with the word LOVE highlighted in the word SLOVENIAN. However, in the official guide to this year’s 25th anniversary of independence, it’s clear that the Slovenes are still hoping for some good national stereotypes because, unlike the Spanish or the Germans, they complain, they don’t have them. And they are still confused with Slovakia. In the markets, shops, taxis and restaurants of Lovely Ljubljana, there is little talk of peace, or love, or war, or even independence. 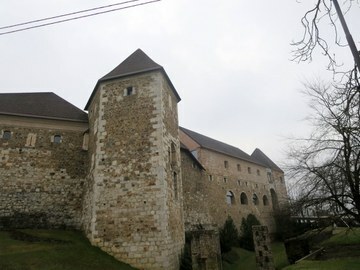 The driving force seems more PR or marketing-led, lots of public posturing but behind the castle walls a concern about jobs; a skilled, well-educated young generation questioning their future in one of the many small and new countries sitting uneasily in the new Europe. But I’m hopeful. As the ecstatic Agatha Christie declared when she visited Slovenia, the Alps here are ‘too beautiful to be tainted with murder’. James Joyce also spent a night here – but because he mistook Ljubljana for Trieste. All photos by Rosie Goldsmith. You can see the full Ljubljana Flickr album here.